I work as an IT specialist at a University, and I'll have about 6 or 7 computers back at my tech shop on a weekly basis that needs to be repaired. From installing or replacing hard drives or other hardware, to cleaning out viruses and spyware, I always seem to have a computer to work on at my shop. There are plenty of times where I have to work on multiple computers at once. Sometimes it could be for one of the previously mentioned issues, or the fact that I have new shipments of computers that have to be setup for users. No matter what the case, space is a premium, and it would not be logical to have a separate monitor, keyboard, and mouse setup for each computer I have to work on in our tech shop. To help me fight through my weekly cache of computers that I need to repair or setup, without taking up several offices or cube spaces, a keyboard, video, and mouse (KVM) switch has proven to be a useful tool I couldn't work without. Its functionality, along with its ease of use, has made daily computer repairs much quicker and efficient. 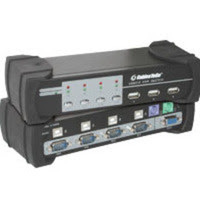 A KVM switch allows you to connect one keyboard, one monitor, and one mouse to a little switch box, which then has ports to connect multiple computers. Older KVM switches only had a vga and PS2 connectors, but newer KVM switches come equipped with a vga and USB connections. My current KVM switch supports up to 8 computers. The computer that sits at the first slot is my ghost server, which I use to push out ghost images or create backup images. Slots 2 through 8 are free to be hooked up to any computer that needs to be repaired, cleaned, or setup. With this current setup, I can now house all of the computers on a 4 layer shelving system, which helps save on space as each shelf can hold 3 computers. For me, the best setup I found was to sit the KVM switch on the top shelf, and run the cables down to all of the shelves below it. This allows for easy access to the proper cables as well as quick hook ups. I am constantly rotating computers in and out of my shop, so easy access to the computers and the cables is a must. The KVM allows me to perform multiple repair or cleaning projects, as I can quickly switch between 8 different computers as I need to. As an example, I can run windows updates on one computer, then switch over to a second computer to check for spyware and viruses, while the scans are running I can switch over to a third computer to create a backup image, and finally switch over to the first computer to connect the ghost server to the client that wishes to create a backup image. I can perform all of those tasks within minute, all while using the same monitor, keyboard, and mouse, all at the same desk. For computer technicians that find themselves working on multiple computers through the week, and even more importantly, need to work on multiple computers at the same time, a KVM switch is an important and useful tool. Smaller shops can get KVM switches that have only 2 or 4 computer connections, where as bigger shops can get KVM switches that allow 8 or 16 computer connections. Each computer technician will have different needs, but no matter what your workload looks like, a KVM switch will help streamline your work queue as well as make your life a little easier. And as computer technicians, anything that makes things easier is always welcomed! For both the Examiner and Video Game Ninja, Abe covers the latest news, info, and reviews on today's video games, tech, and gadgets.